At 11.45pm, a faint knock on my bedroom door chills me to the marrow. I am lying on my back, head propped on a pillow folded into two for extra elevation. My phone is in my hand and has been for the last 13 minutes, having just discovered this series on Financial Times “Lunch with the FT”. It is a weekly column featuring interviews with the world’s icons- conducted at a restaurant table over a meal. From writers to tycoons, film stars to politicians, fashion gurus to the glitterati of the music world, the stories are captivating and the writing sublime. I also just found out that there is a paperback version on Amazon featuring the best 52 interviews and I am hoping Santa can sneak in through the chimney and place it under our Christmas tree. I have been a good girl, save for a few peccadilloes here and there. The plan was to read a feature a night but they are quiet addictive and enthralling these write ups. On this night, five minutes ago, I was cracking up over the writer’s description of Oliver Stone (wild of hair and polite of mood!) and marveling at the formidable genius that Stone is. Done with the post, I look at the time on my phone. It’s 11.43pm. One more feature will surely not cost me sufficient sleep now, will it? I scheme through the interviews…Donald Trump-enough of him already! Angelina Jolie-overrated, Angela Markel- book mark it for later, Michael Caine-loved him in Scandal so yes maybe, Paul Kagame-not ready for the morbid bit about genocide, Mo Ibrahim-this should be interesting. And then I see Tom Ford! I certainly want to understand the mind of this erudite fashion designer and film maker. How he transformed Gucci into a $10 billion empire, having lifted it from the edge of bankruptcy 14 years before. I needed to know how he overcame being fired from Gucci, and how he built his eponymous fashion empire. But just as I am settling into Tom Ford’s interview, I hear a faint but meticulous knock on our bedroom door. It’s 11.45pm. I turn my head to the left. The mister has blacked out, curled like a fetus and probably dreaming of life in the womb! For a moment, I think I am hallucinating but then the knock persists, this time louder than the first time. I want to believe it’s my sis, but what could she be possibly looking for at this hour? We are not a family of sleep walkers. It wouldn’t be Xena our four-year-old daughter either, because she suffers from nyctophobia. Extremely scared of darkness. 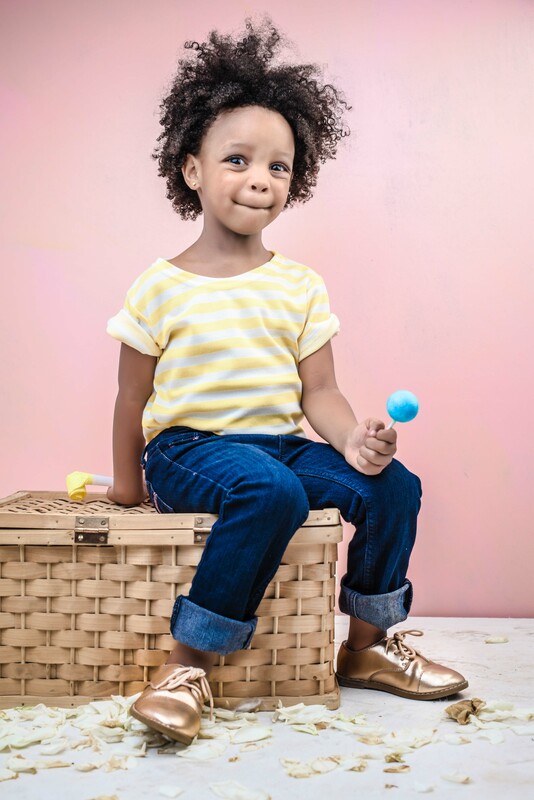 Whenever she wakes up in the dead of the night, she calls out for the dad from her bedroom (always the dad, never the mum) in the loudest voice possible, even the watchmen downstairs would hear her and in the morning as we are driving out, one of them would stop us and say “Mtoto alikuwa anapiga nduru usiku akiita babake, ako sawa?” *insert kisii accent* loosely translated as “the child was screaming and calling out for the dad at night, is she ok?” You should see how the dad stumbles out of bed and sprints to her room, like Liam Neeson in Taken, moving across Europe to save his estranged daughter. Only for him to be told “I want water” in the faintest voice. It is always hilarious, at least for me. I switch on the bedside light and finally ask the intruder to come in. My heart is racing. The door handle slides down and the door swings open. It turns out to be Xena, after all. I am impressed at how much she has matured, but worried about her sleep interruption. “Ok. Let me get you an extra sweater.” I respond, as I lift the covers with the intention of getting out of bed. I am dressed in a tiny hugging t-shirt and shorts and feeling quite hot. It suddenly occurs to me that if anything, she should be complaining about sweating and not freezing, given that she’s dressed in a heavy bodysuit. She’s a bright one though as she quickly changes tactic. “I don’t want a sweater; I am just scared.” she says. “But you are two of you and I am alone.” She retorts, her voice bearing severe indignation and a sense of accomplishment. It’s Friday night anyway and she will not be going to school the following morning, so I ask her to close the door behind her and pat the middle section of the bed, motioning her to jump in. Her countenance suggests victory! I imagine how she must have tossed and turned and toyed with the idea of coming over to our room now that sleep was elusive. To muster the courage to knock on her ironclad mom’s door all for a breezy reason (see what I did there? Hehe) must have taken a lot of resolve. But here is the most remarkable bit about this whole narrative. I was extremely impressed at the way she held up that argument. How she quickly changed strategy when the initial one failed, manipulating me into believing that it’s indeed unfair that she sleeps alone and would have to face a one-eyed monster or a three-legged dog solo! (those are the things she worries about!). She clearly is a strategic thinker and a go getter with unswerving determination. I was determined to have her accompany me for my meeting the following morning, because who knows, she probably had the virtuosity to tip the scale in our favor, as far as clinching the deal was concerned! And boy did she slay! At 9.00am, we are cruising on the Thika Super Highway heading to the Export Processing Zone (EPZ). 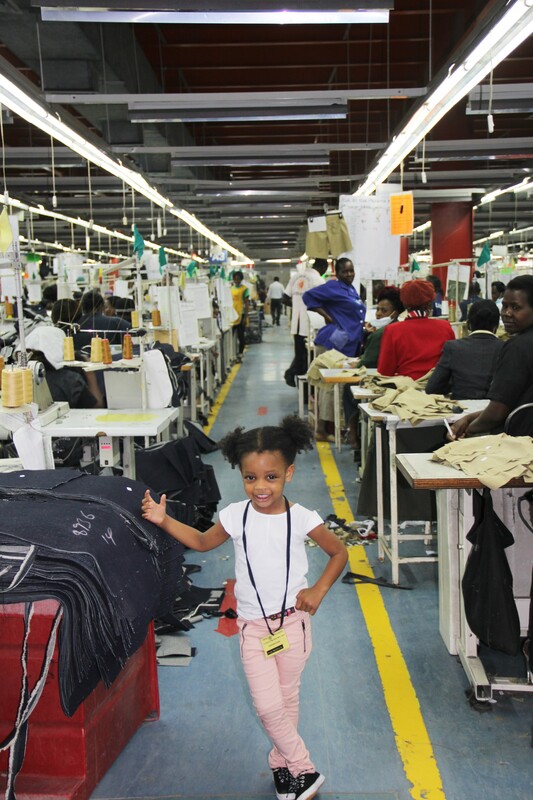 I had aptly informed my little assistant that she was going to learn the art of making clothes at one of the largest garments manufacturers in Africa. I recently learnt that she has mustered several continents and she understands that she comes from Kenya which is in Africa. At her age, I only knew my hood! I am hoping that she will doze off and I can listen to the mellow music filtering out of the car stereo. There’s this show on Homeboyz Radio that I look forward to on Saturday mornings as I drive to Karura Forest for my run. Sometimes I have the least conviction to run but then I get out of bed at 6am, just for the drive and the music. Cherotich Sage is belting out Maskini and I pump up the volume. But Xena has different plans for me. Expecting her to be awake and quiet is like standing under a running shower with my clothes on and hoping that they don’t get drenched. It is IMPOSSIBLE. So, she asks a million and one questions for the entire 30 minutes’ drive. What is a factory? Why are we driving on top and not down? -as she peers at the underpass. Where are those cars going? -pointing at the ones veering off the highway into the slip roads. Is that the factory? -pointing at Garden City Mall. When will we reach the factory? Finally, after managing to cleave our way through a multitude of cars and human traffic, we arrive at the factory. Three long, rustic buildings, one on the left and two on the right- parallel to each other, stretch expansively, and it is almost impossible to see how far they go. The place is unusually quiet, with no sight of people moving about, save for three askaris and some guys in blue overalls hauling what I imagine are packed garments ready for shipping, into a lorry. Steve the project manager meets us at the reception and with our lanyards hanging loosely around our necks, we are ushered into one of the four processing units. 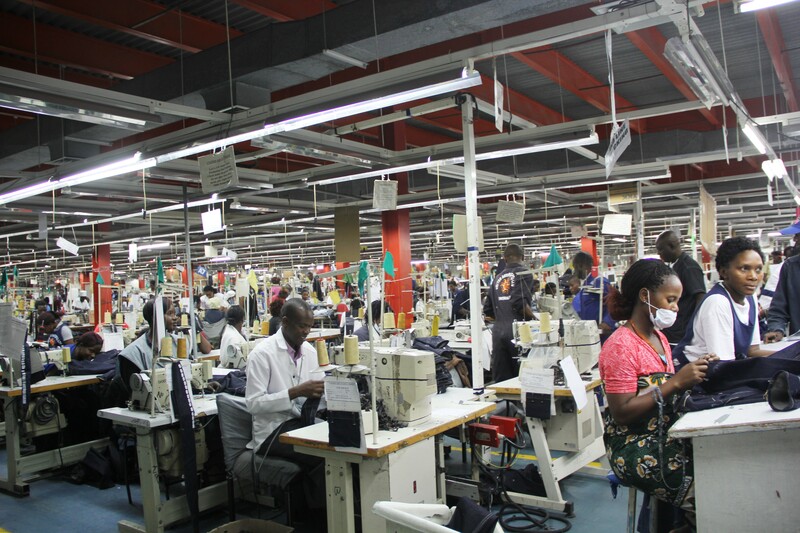 The factory is a flurry of activity, as would be expected of an establishment that employs close to 10,000 people! I am overwhelmed by this statistic as I imagine the number of livelihoods that this company supports. As we walk through the various sections, the supervisors take time to explain how the different roles are handled. The workers stare at us with faces full of curiosity and amusement at my protégé, Xena. 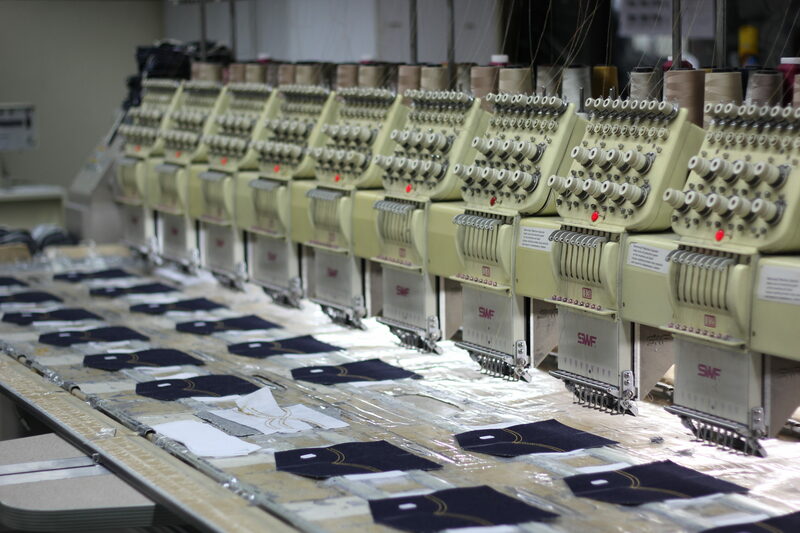 From fabric inspection and thread winding to quality checks and warehousing, everything is done so meticulously and I am amazed at the dedication that the handlers have for their various roles, however mundane some of them seem. Some people are tasked with removing loose threads on garments (with clippers) while others fix buttons on trousers all day. If I handled buttons all day at work, I would go home in the evening and just as I drift off to sleep, I would imagine that my house is flooded with buttons, and is sinking at their weight. Sleep would completely evade me. I would ban buttoned clothing in my house and would walk out in a huff and file for divorce if the mister brought me a buttoned shirt from one of his trips. 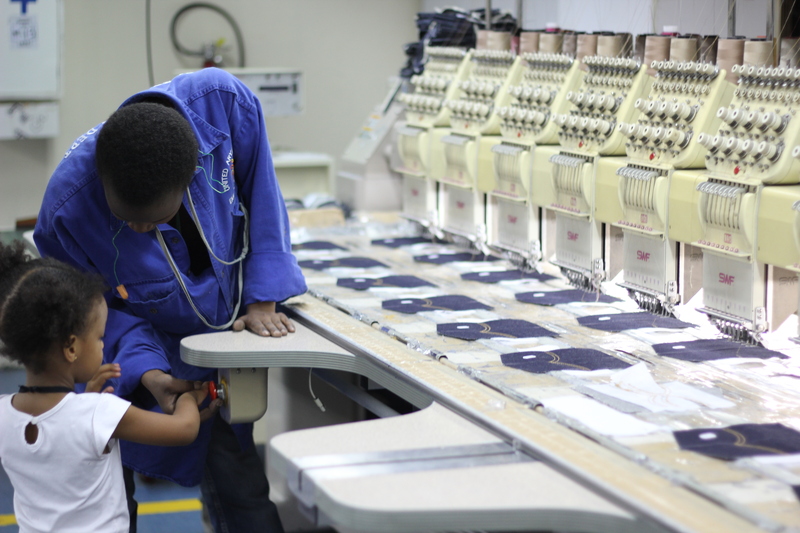 These people though smile at the buttons as they fix them because they are passionate about their jobs. Steve informs me that the roles are changed intermittently to keep them from having nightmares about buttons. Or clippers! As I marvel at how all the fashionable pieces are assembled from scratch (they call it Dirt to Fashion), Xena amazes us with the things she takes interest in. 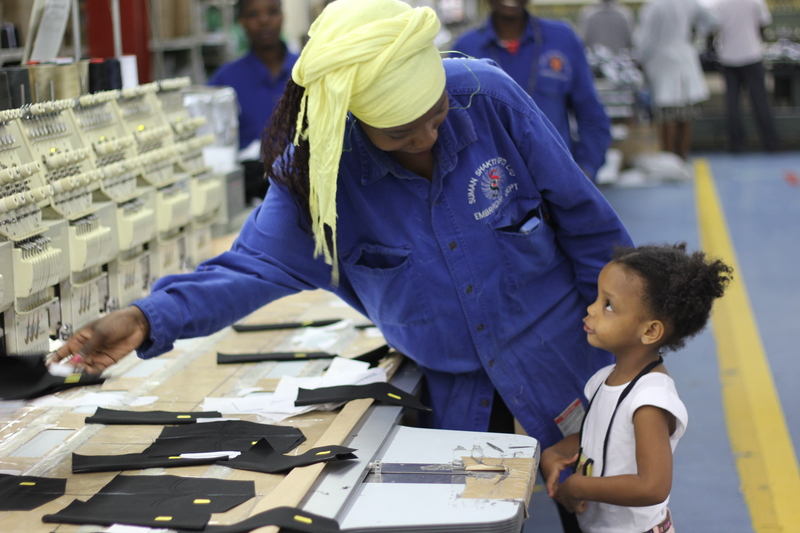 When we first walk into the factory, she spots these small black pieces of fabrics with yellow stickers and as I inquire from Steve their purpose, she tugs at my pants and says “mama look at pockets like the ones on my trousers”. At one point, she walks over to this short swarthy complexioned man who introduces himself as Pastor John. 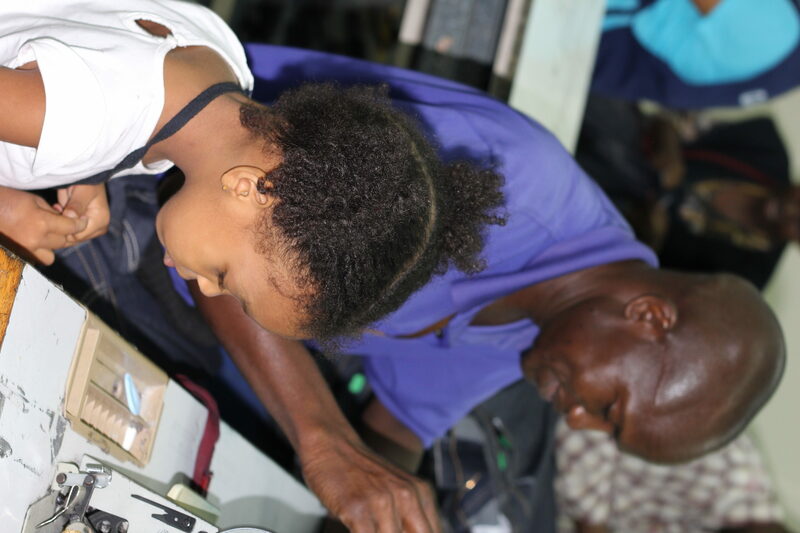 She picks the colorful chalk lying on the sawing machine and asks to mark the pieces that he is splicing, then tells him to stitch along the areas she has marked (of course he doesn’t!). 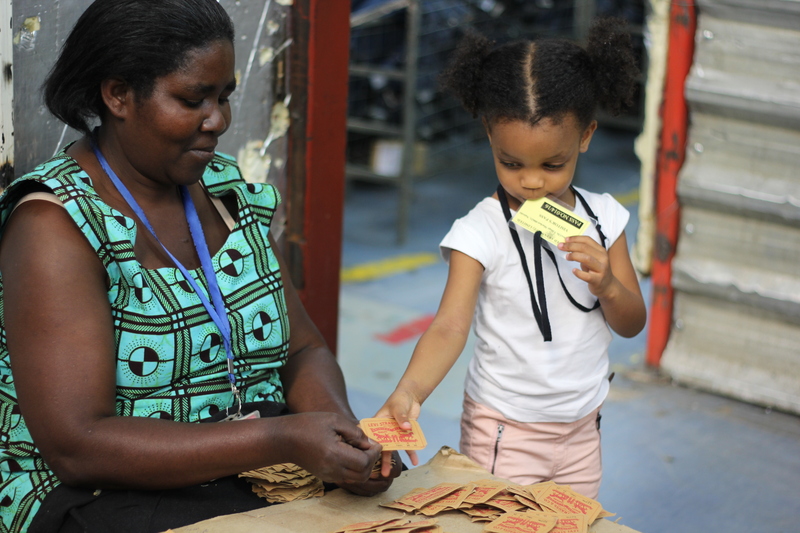 Next, at the quality control section, she asks for a clipper from one of the ladies and helps to get rid of unwanted thread, with her guidance. As we drive out of the complex, Xena goes out like a light! I check the clock on the dashboard and it dawns on me that we have been on our feet for two hours! No wonder she is bushed. I drive in complete silence, amazed at how idyllic those two hours have left me feeling. I wanted to be left alone in the factory, when everyone else went home. 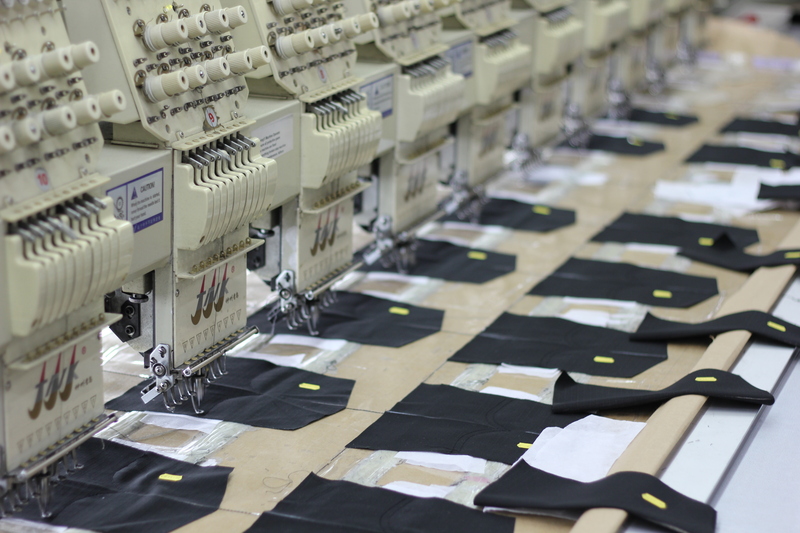 I would feel the fabrics for hours on end, soaking in nuances that would otherwise evade my touch on any other day. 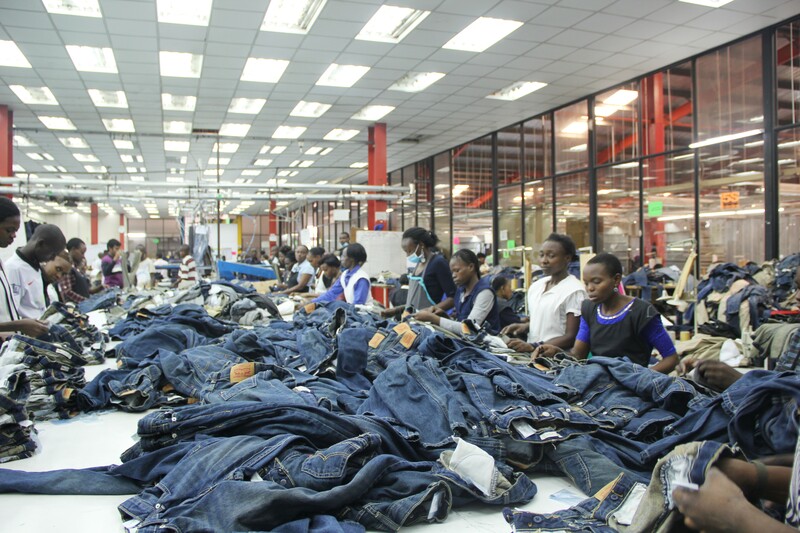 I would smell the garments to my satisfaction (I am fascinated by the smell of new clothes), delighting in the fact that Kenya is indeed a hot bed of ingenuity. I would hug the meticulously finished pants so hard and finally try on as many designs as possible! I drive past University of Nairobi’s Chiromo Campus on my way home and I can’t help but think how Sciences are so overrated (I studied Statistics and always loved Math). I am now convinced that Art is life. I also wonder what pursuits Xena will take up, but seeing her full of life at the factory and bearing in mind her love for fashion at such a young age, she may just be the next Tom Ford (less all the cons)! I am immediately reminded how I left that feature pending and I cannot wait to drop Xena home and head to Talisman to enjoy a glass of Sangria and catch up on my reads! 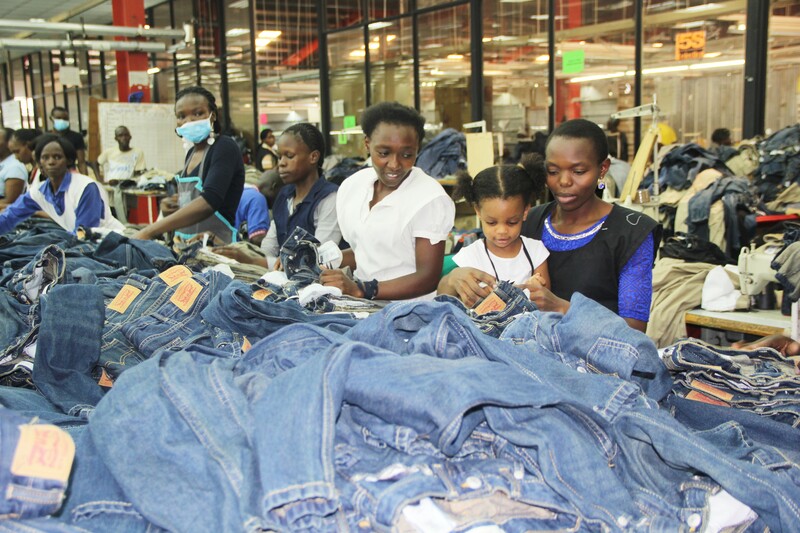 United Aryan (EPZ) Limited has been operational in Kenya since 2002, producing garments for international brands including Levi and H&M for export markets. 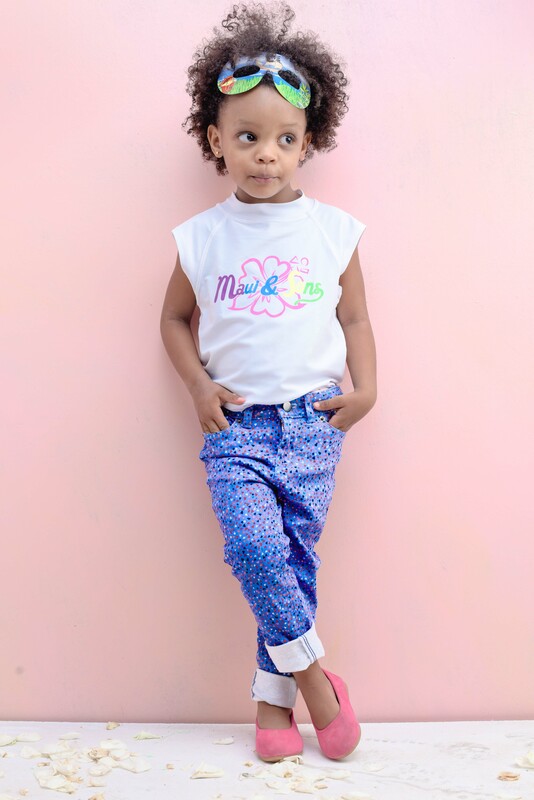 Under the name Alladin World of Brands, the company has finally decided to cater to the local market by producing fashionable export quality garments priced at unimaginably affordable levels. 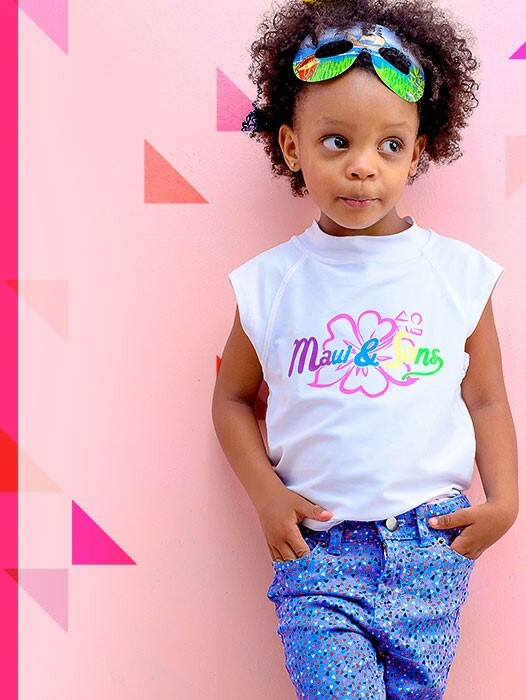 Check out their website ( www.alladin.co.ke ) for daily deals that go as high as 75% off and sign up for their newsletter to get 25% off your first purchase. Very informative piece amidst the humor. I’ve checked out the website and already subscribed to the newsletter hoping to catch some bargains. Hehehhee am still laughing ,this was such a lovely post .. It was funny and insightful and learned a lot from it .. U always make such dope comebacks from being MIA .. Hehehe ..
Xena is such a genious ,she is a lot of things wrapped up in one.. Love that ..